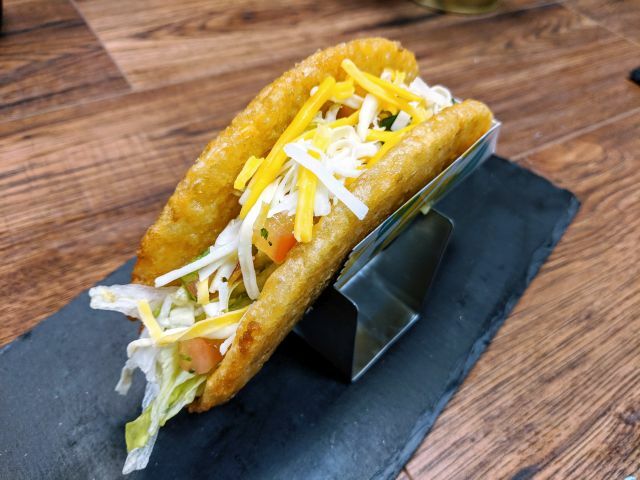 Taco Bell Working on a New "Quesalupa"
Frito Pie Taco in the Works for Taco Bell? Smashburger's Smashfries feature French fries tossed in Italian olive oil, rosemary, and garlic. An order cost me $2.29. The fries come in a good-sized serving. It's probably about the same amount as you'd get in a large order of McDonald's fries. As for the fries themselves, they're cut into shoestrings and are a tad narrower than McDonald's fries. They turn out very crispy, but with the very skinny cut, there's not a whole lot of potato flavor going on. Other than that, the rosemary and garlic combo is very enjoyable. The rosemary, especially, gives the fries a different flavor profile than most other fries. I didn't taste the olive oil much. Overall, Smashburger's Smashfries were good, especially if you prefer thinner, crispier fries. I like them a bit thicker for a stronger note of potato as well as that fluffy interior. The seasoning works out really well.